The Bondcelon wheel is made of macerated fabric which is impregnated with phenolic resin and molded under high pressure and heat to form a high density, tough, shock resistant economically priced wheel. They provide excellent load carrying characteristics and are non-marking. They will not spark. Bondcelon wheels are resistant to water, oils, grease, animal fats, commonly used acids and detergent solutions. Temperature range is -50 to +260 degree Fahrenheit in continuous operation with intermittent use to 300 degree Fahrenheit . These wheels are provided with straight roller bearings in all sizes with tapered roller bearings available in diameters of 5 inches and larger. 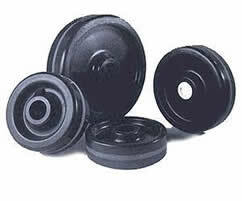 Lubrication is through a pressure fitting recessed in a hollow axle. Most larger sizes can be fitted with a pressure fitting in the hub on request. Consult factory for high heat applications, straight or slab sided wheels, special hub lengths, grooved wheel face, grease seals or other bearing types. Loading rating is for manual operation. Hub length shown for tapered roller bearing wheels includes spacers.